In case you’re wondering why the change in format, it’s because, sadly, NOJCSC is still looking for an editor for Intermission. Larry Ward did an amazing job as our previous editor — thanks, Larry, for all your time, effort and love. Trombonist, vocalist and band leader Paul Ingle will be joining us all the way from Melbourne, Australia, at our next club meeting. Definitely do NOT miss this one! 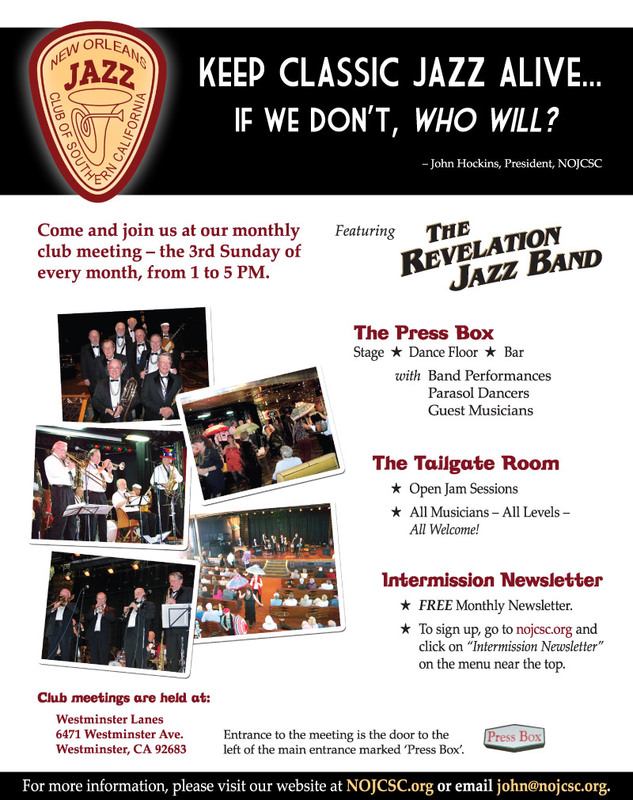 Join us at our next club meeting on Sunday, July 15, 2012 at the Press Box at Westminster Lanes (info below) for an entertaining afternoon of traditional jazz featuring the Revelation Classic Jazz Band and guest musicians!